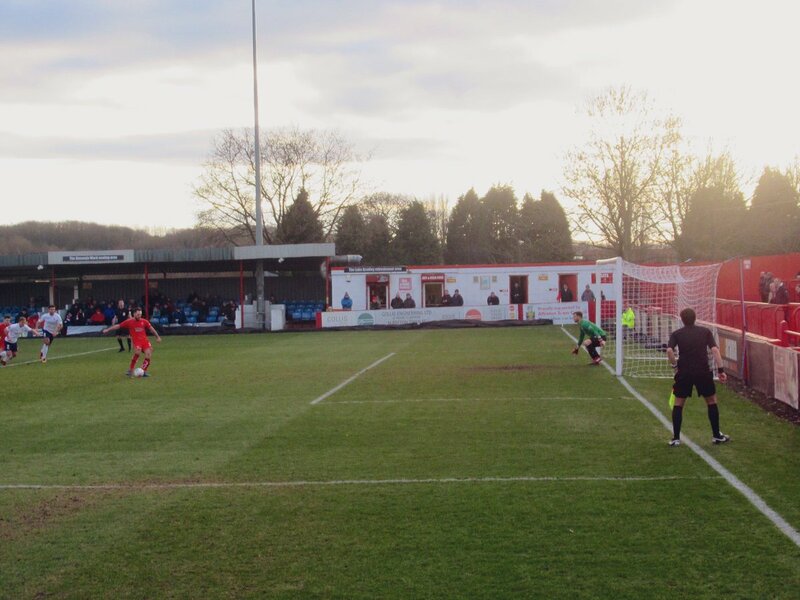 Alfreton Town surrendered a 2-1 lead with six minutes to go, as two late York City goals snatched the three points in a thriller at the Impact Arena on Saturday. Billy Heath made just the one change with Danny Clarke coming in for injured Richard Peniket. Nyle Blake made his first bench appearance since signing on loan from Mansfield Town, Nathan Hotte also returned to the bench. We started the game at a decent pace with Reece Styche finding Clarke whose cross was cut out. Tom Platt had the first sight of goal with a header which went wide of the far post from Bobby Johnson's free kick. Sean Newton struck wide for York before the City striker opened the scoring after 11 minutes racing onto a loose ball at the back which resulted in confusion at the back between Martin Riley and Sam Ramsbottom, Newton beat Sam to the ball and finished superbly with a lobbed finish from the touchline into the far corner. It was another frustrating moment for the Reds who had started a game well, only to make a mistake and find themselves trailing. Burgess fired way over the bar before Newton again looked to test Ramsbottom but his first effort went wide of the post before Sam saved Newton's second effort well after a neat one-two in our box. Alfreton were growing into the game with Riley nearly found by Josh Wilde before Sam plucked out Newton's left wing cross at the near post. With 34 minutes gone we were awarded a penalty when Reece Styche was dragged down in the box, the Reds striker stepped up and planted the penalty into the right corner with Bartlett getting a touch. The contest was lifted with the Reds equaliser and we looked to push but good defending from Mirfin and then several blocks in the box denied Johnson any sight of goal. The second half began with an early opening for York as Kempster forced a save from Sam, then on 51 minutes we took the lead as Styche was picked out on the right side, he accelerated away from his man before finishing low into the far corner as Bartlett got another hand on the effort. It was a deserved lead on the run of play as the Reds had largley dominated since the York opener in the first half. Moments later David Lynch had a chance at making it three when he was put through by Styche, but his low effort lacked power and was saved easily. McLaughlin hit a free kick way over the bar before Johnson weaved his way through the York defence, beating three players before finding his cross partially cleared to Wilde whose well hit shot was saved. Newton was threatening again as he had a shot wide after 64 minutes after a spell of head tennis in the Reds box. Then with 69 played, the Reds were awarded another penalty as Styche was hauled to the ground after a corner from Johnson, Styche stepped up and opted for power which saw the ball smash of the bar and cleared away. This proved a turning point in the contest with City transformed into a team of hope and drive. The visitors got the equaliser after a sustained period of pressure which saw us clear multiple corners, the second corner resulted in a brief scramble before the ball was hooked into the far corner by Kempster to the delight of the travelling support at the Alma Street end. Alfreton buckled at the equaliser and looked rattled as rash tackles and rushed clearances greeted us in the final stages. Just four minutes after the equaliser, York won a penalty after holding in the box, Jordan Burrow stepped up to finish past Ramsbottom to cap off an incredible six minutes or so for City and capitulation for the Reds. It was another tough defeat to take after a performance which warranted the three points, The Reds were left to pay the price for missed chances both in the first half and at 2-1 up in the second half. Alfreton will need to work on their clinical side and finishing contests off if we are to pick up three points on a consistent basis. It was an undeserved defeat on the basis of play but certainly one the Reds will need to recover from after a good overall performance, this made the late implosion even tougher to take. Next up, we travel to in form Curzon Ashton on Saturday with a 3pm kick off. ATFCXI: Ramsbottom, Clackstone (O'Brien 89), Wilde, Lynch (Sinnott 90), Shiels (c), Riley, Styche, Platt, Clarke, Johnson, Smith. Subs Not Used: Nicholson, Hotte, Blake.